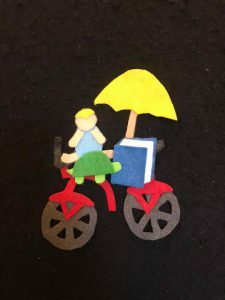 We had a blast reading stories about riding bicycles during our Preschool Storytime! 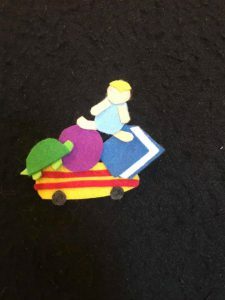 Here are the books, songs, flannel board, action rhymes and video we shared. 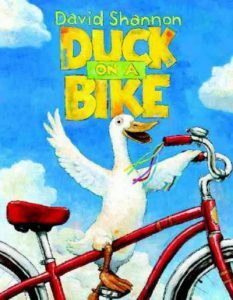 Duck on a Bike by David Shannon tells the story of a Duck who inspires all his fellow farm animals to ride a bike! Well they don’t really buy into his enthusiasm for bike riding until they get a chance to see what it’s like firsthand! How did they get a hold of so many bikes? You’ll have to read the story to find out! 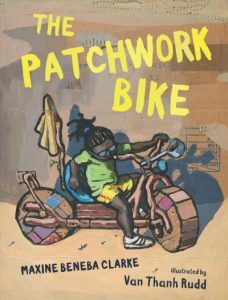 Everyone knows part of learning to ride a bike is learning how to STOP! 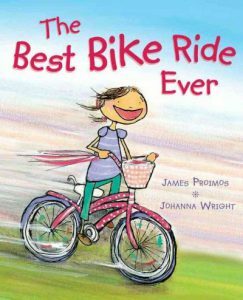 In The Best Bike Ride Ever authors James Proimos and Johanna Wright introduce us to Bonnie – a young girl who gets her very first bike! She’s so excited that she hops right on even though she hasn’t learned the proper mechanics of using the brakes. Bonnie takes a wild ride downhill, over mountains, to the top of the Statue of Liberty, to the bottom of the Grand Canyon – you get the picture. What finally stops her? A toy truck on the road and OOF! She falls. Back to the drawing board as her parents comfort her and show her how to use the brakes. 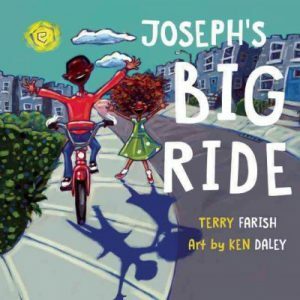 Then it’s ride, ride, ride until she starts thinking of her next dream – getting a pony. New Red Bike! 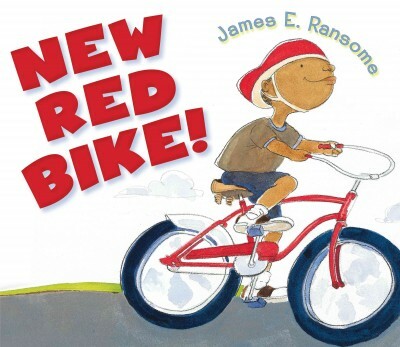 by James E. Ransome shows us Tom riding his new, red bike to his friend Sam’s house. He knocks on Sam’s door but there’s no answer. 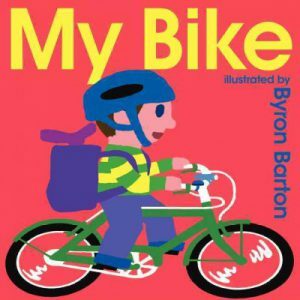 When he turns around – his bike is missing! Where is it? Tom looks everywhere until he finally sees Sam riding toward him. Sam apologizes for taking Tom’s bike and they both decide that sharing is the best way for both of them to enjoy riding UNTIL Tom gets his very own bike from his mom and dad. Now they can ride their bikes together! How Will We Get to the Beach? 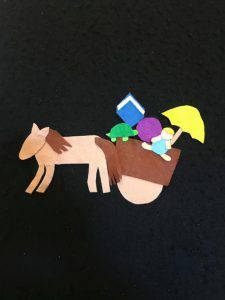 Roxanne is bringing 5 things to the beach: a baby, purple ball, umbrella, turtle and a big book! Oh no! Something is missing! Can you guess what it is? THE PURPLE BALL – there was no room for the purple ball! Roxanne decides to use her skateboard to get to the beach. Oh no! Something is missing! Can you guess what it is? THE UMBRELLA! – there was no room for the umbrella! Roxanne decides to take the bus! 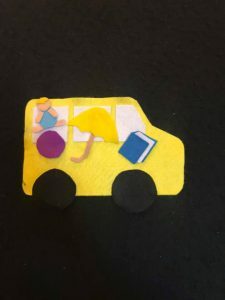 The bus will definitely fit everyone and everything! Oh no! Something is missing! Can you guess what it is? 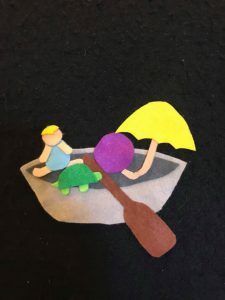 THE TURTLE – no animals are allowed on the bus! Roxanne decides to take her canoe to the beach! Oh no! Something is missing! Can you guess what it is? THE BOOK! – the book may fall into the water! Roxanne decides to take the next best thing! A hot air balloon! Oh no! Something is missing! Can you guess what it is? THE BABY! 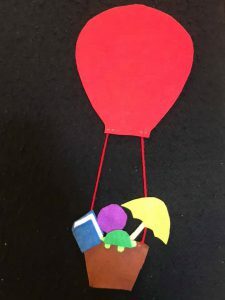 – the baby was too scared to ride in the hot air balloon! Roxanne had one more thing up her sleeve! She finally loaded everything onto a cart and pulled out her friendly horse. The friendly horse pulled the cart (and everyone and everything in it) ALL the way to the beach where everyone enjoyed a fun and beautiful day! We share a lot of songs, bounces & rhymes during storytime! You’ll find lyrics/words to those songs & rhymes we shared without CD accompaniment here. Now we’re here let’s have some fun! Then we bend and touch our toes. Children love to sing and dance to music. Here are some of the action songs & rhymes on CD that we used in storytime. Click onto the CD titles to find these items in our library catalog. “Oh Children Ring Your Bells” from I Love to Hear the Sounds by Kathy Reid-Naiman! 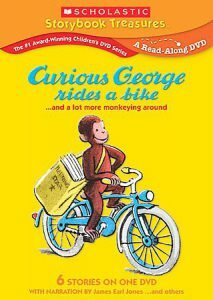 If you’d like to read more books about bicycles, check these out from your local Pasadena Public Library!